A family fights to survive in silence when a rare species of killer bats suddenly swarms the planet. Montclair, N.J. – 20 Miles Northwest of NYC – Hugh Andrews, his wife Kelly, their deaf daughter Ally, their younger son Jude, and Kelly’s mother Lynn learn about the killer vesps and the need to stay quiet from a television broadcast. Hugh’s longtime best friend Glenn joins the family as news breaks about the epidemic causing death and chaos worldwide. Deciding to get away from the city, Glenn and the family take two vehicles and head out on the road with Ally’s dog Otis. On the drive, Ally uses her iPad to FaceTime with her crush Rob about the crisis. While stopped at a gas station, Glenn shoots an armed man in his leg when he tries carjacking Hugh. A traffic jam forces Glenn and Hugh to drive off road. Glenn overturns his vehicle down an embankment when he swerves to avoid hitting a deer stampede. Glenn forces Hugh to go on without him after he becomes trapped in his wrecked vehicle. Vesps swarm Hugh’s vehicle while his family panics inside. Glenn fires his gun to draw the vesps to him. Glenn dies. Hugh is forced to let Otis go because of his loud barking. Lynn’s asthmatic cough draws a vesp back to the vehicle. Hugh throws a tire iron to draw the vesp away. Hugh then uses Lynn’s cigarette lighter to torch Glenn’s vehicle, which summons vesps to immolate themselves. Unable to use their vehicle due to its noise, Hugh, Kelly, Ally, Jude, and Lynn hike into a forest on foot. The family finds a fenced cabin compound. Vesps attack and kill the elderly owner when she comes outside to chase away the family with a shotgun. Hugh and his family crawl through a drain tunnel to get past the fence. A hissing rattlesnake attracts vesps that bite and claw Kelly’s legs. Hugh activates a wood chipper that draws the swarm to their deaths. Everyone makes it inside the cabin where they begin treating Kelly’s wounds. Ally contacts Rob again and discovers that his family’s situation is growing worse. Lynn tells Hugh and Ally that Kelly’s infection will spread if they don’t treat her with antibiotics. While Jude stays behind with Kelly and Lynn, Hugh and Ally explore a deserted town to retrieve medical supplies. After escaping another vesp encounter, Hugh and Ally meet a tongue-less man who calls himself ‘The Reverend.’ The Reverend asks Hugh and Ally to join his cult called ‘The Hushed.’ Hugh and Ally politely refuse and return to the cabin. The Reverend comes to the cabin with several followers. Hugh again refuses to join The Hushed. The Reverend implies that he wants Ally for procreation purposes. Hugh pulls a shotgun on The Reverend, which compels him to leave. A little girl comes to the cabin later that evening. Hugh lets the girl inside. The family realizes she is one of The Hushed when they see her missing tongue. The girl reveals a vest of cellphones that suddenly begin ringing. Additional cellphones planted all over the cabin draw a swarm of vesps that break through the windows. In the commotion, several members of The Hushed break in to abduct Ally. Lynn gets Ally away from her abductors outside. Lynn sacrifices herself by screaming to draw the vesps toward her and the kidnappers while Ally escapes. Hugh and Kelly fight back against the attackers and eventually kill The Reverend. Hugh, Kelly, Ally, and Jude hike north until they finally reach The Refuge. Ally reunites with Rob and they begin adapting their survival skills to hunt vesps. Before getting too far ahead, let’s quash any lingering “ripoff” allegations right out of the gate. “The Silence” seemingly Xeroxes “A Quiet Place” (review here), right down to dropping a degradedly colorless copy in an apocalypse trope tray at the end of its apathetic assembly line. However, Netflix adapted its killer bat thriller from author Tim Lebbon’s same-named 2015 novel, predating John Krasinski’s smash hit by three years. Even though “The Silence” looks, walks, and quacks like a clumsy clone of something previously done much better, it has a right to stake an “I was here first!” claim. Being a formulaic fright film, “The Silence” starts with a prologue pop, warning that after this initial injection of action, you’d better buckle in for a bunch of boring exposition. Spelunkers excavating a cavern underneath Pennsylvania inadvertently open a subterranean chamber that’s been sealed for millions of years. Out come countless prehistoric bats. Drawn to loud noises because they are blind, the killer creatures soon swarm the entire country, threatening to topple civilization as major cities are consumed by chaos. You probably have as many questions about this premise’s plausibility as the movie has CGI bats. Instead of offering explanations, “The Silence” jumps to an opening title sequence of strange stock footage maybe meant to illustrate a vague progression of civilization or something. A skyline of smokestacks, a battleship firing a missile, earthmovers bulldozing a landfill, a negative image of an alligator. It’s the perfect montage for telegraphing that “The Silence” tees up a hodge-podge of half-baked ideas hastily flung together with little rhyme and even less reason. Next we meet The Andrews Family. Father Hugh works as a construction site manager with his longtime best friend Glenn. Deaf daughter Ally gets bullied for her disability, but has a budding beau in her crushing classmate Rob. Soccer mom Kelly stays home with her ailing mother Lynn and younger son Jude. Don’t bother taking notes as these bits become instantly irrelevant. Even Ally’s deafness plays no appreciable role in the plot. In fact, if it weren’t for the family’s use of sign language, which they frequently forget they can do, you might never notice Ally’s deafness. Ally doesn’t either, as evidenced by weirdly keeping the volume turned up on her iPad. It’s incredibly odd to start with a setup where killer bats are about to bring Armageddon to Earth only to then introduce low stakes side stories involving a job site conflict and grandma’s medication. Is an audience expected to invest in a teenager’s love interest when the entire fate of humanity lies on the line? A hammer, nails, and a few boards seem like all anyone would need to fortify a home against bats. Yet when the epidemic reaches the Andrews household, the family decides it would be smarter to go on the move with no real destination in mind. In keeping with their head-scratching plan, everyone packs up and sets out for the standard survival scenarios already done to death before “The Walking Dead” beat that horse further. You know how it’s often said the undead could be replaced by any other danger in a zombie movie and it would effectively remain the same story? “The Silence” provides proof. Content was apparently cut to ribbons, either during writing, shooting, editing, or some combination of the three. Characters and concepts come and go on sudden whims. The exact passage of time also isn’t clear. It looks to be only a few days from excavation to complete societal collapse. Yet whatever the span is supposed to be, the movie’s world comically creates a narrative for the catastrophe in record time. The bats come to be known as “vesps.” Dead areas are dubbed “The Gray.” A sanctuary in northern snows names itself “The Refuge.” Almost instantly a cult of tongue-severing zealots called the “The Hushed” enacts a plan to restore the population by forcibly impregnating young women. And you thought you had a busy week. Several beats included for shock value don’t add up to sensible characterizations. At one point, the family finds a cabin in the woods where they want to take shelter. When the elderly owner comes out to shoo them away, the commotion she unknowingly causes draws bats that devour her. For the crime of protecting her own property, The Andrews Family writes this innocent woman a death warrant. How heroic! “The Silence” constantly undercuts itself with details that don’t work in the fiction’s favor. In another instance, grandmother Lynn asks her daughter Kelly if they should tell granddaughter Ally about Lynn’s terminal illness. Later, Lynn martyrs herself to save Ally, but her sacrifice seems less selfless in light of the revelation that she was headed for death anyway. Adding insult to her fatal injury, Ally is promptly recaptured by the kidnappers Lynn killed herself over, making her death an exercise in futility. It’s telling that a high number of speaking roles are credited to characters with names like Man with Shotgun, Woman with Shotgun, Mother, Subway Man, Woman Caver, and Child in Car. Remember, it’s just as easy to name those same people Bob, Mike, Sally, or Sue. But even co-writers Carey and Shane Van Dyke knew not to waste effort pretending their script wasn’t generic. Stanley Tucci singularly stands out as the unquestionable MVP. He alone wills “The Silence” to be watchable. There’s just something endearing about watching Tucci effortlessly play everything with a grimly studious face even though he undoubtedly realizes he’s trapped in a bland B-movie. “A Quiet Place” sustained suspense because its threat was hidden everywhere and could come out to kill at any time. Its characters never had more than a moment to catch their breath and by extension, neither did the audience. Here, the creatures often announce themselves as a shrieking horde. They’re easier to avoid and easier to outsmart, which is why Hugh, Ally, and everyone can spend so much time talking about the danger like they’re deciding how long to roast a turkey. For a horror film, the only worse crime than being dull is being tame, and “The Silence” commits them both. 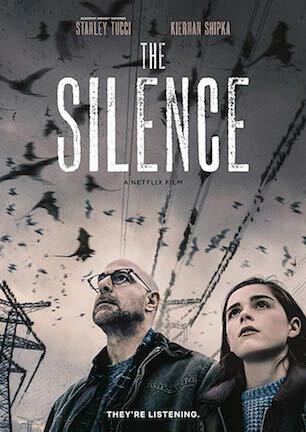 “The Silence” answers the question, what would a Syfy creature feature look like if it replaced campy charm with a misspent big budget and name actors taking the tone too dourly? I don’t know what Netflix’s equivalent of a DVD bargain bin is, but “The Silence” definitely deserves to be exiled there. April 12, 2019 by Ian Sedensky.